This week’s #TeamFYNSports Writer Player of the Week is Senior wide receiver Josh Cain. Cain led the Dragons in receiving this past Friday on the road at Heritage, finishing with 86 yards on 6 catches, & 1 touchdown. Cain also played the majority of the game on defense as well collecting 4 total tackles, 3 being solo. Cain also had two kick returns on the night for a total of 35 yards. For the season, Cain is 2nd on the team in receptions with 31, 2nd in receiving yards with 400, & tied for 2nd in receiving touchdowns with 2. Be sure to come out to North Murray tomorrow night to see Josh Cain and the rest of the Dragons as they compete in a mini-playoff for a chance at making the state playoffs. The mini-games between Pickens, Northwest Whitfield, & Southeast Whitfield will start at 7 p.m. with Pickens taking on the Bruins of Northwest Whitfield to start things off. Last night, the PHS Dragons varsity football team began the region portion of their schedule by hosting their longtime rival, the Gilmer Bobcats for Homecoming. With it being such a big game, Pickens decided to break out new black uniforms for a blackout. The Gilmer Bobcats won the toss and elected to receive to begin the ball game. After converting a third down & getting a first down, the first drive of the night for the Bobcats stalled and the Dragons found themselves with good field possession their first drive. The opening drive for Pickens ended in six after a 19-yd TD run for Junior Robert Davis at the 6:13 mark to give the Dragons a 7-0 lead in the 1st quarter. Pickens tacked on another TD at the 3:09 mark after a 30-yd connection from Senior Jacob Brumby to Junior Zach Goss Jr. The PAT would fall wide, but the Dragons held a 13-0 lead, still in the 1st quarter. Brumby then connected with Davis for a 47-yd TD strike to stretch the Dragon lead out to 20-0 at the end of the 1st quarter. Just after the 2nd quarter got underway, Sophomore C.J. Streicher took the punt return 47-yds to the house to make it 27-0 with 11:05 left in the half. After a turnover, Pickens turned it into points after a 34-yd TD run from Trevon Hawkins at the 10:43 mark to make it 33-0 Dragons in the 2nd quarter. Brady Moore made it 40-0 after a 2-yd run at the 6:50 mark. 11 seconds later, Zach Swaim scooped up a Gilmer fumble & took it all the way to make it 47-0 Pickens with 6:39 left in the 1st half. At the 1:17 mark, the Dragons forced a safety to extend the lead to 49-0 going into halftime. At halftime, Miss Haley Aiken was named 2017-18 PHS Homecoming Maid of Honor, & Bailey Payne was named 2017-18 PHS Homecoming Queen. The 2nd half saw a running clock. In the 3rd, Brady Moore would collect his 2nd rushing TD of the night, this one from 52-yds out to make it 55-0 with 11:13 left in the 3rd. Pickens held a 55-0 lead over the Bobcats going to the 4th. The lone score in the 4th saw Dawson Turner take it in from 12-yds out to make it 62-0. The final, Dragons take this one, 62-0. 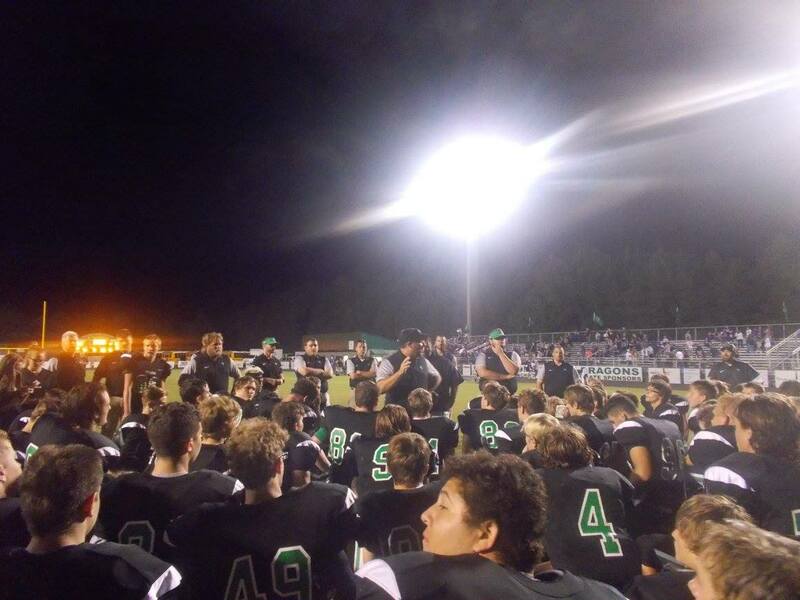 With the win, Pickens is now 3-2 overall & 1-0 in 6-AAAA region play. Next week, the Dragons will continue their region schedule as they travel to Southeast Whitfield to take on the Raiders. This will be the first road game for Pickens in about a month. The Raiders are 5-1, & 1-1 in region play. On what was a rainy, turned foggy evening last night, the PHS Dragons varsity football team traveled to take on the Heritage Generals. Coming into the game, Pickens sat 3rd in the region at 3-2, while Heritage was just ahead at 4-1. The winner, would finish 2nd in the region, & host the 1st round of the state playoffs next week. Pickens won the toss, but elected to differ to the 2nd half. Heritage, with the help of some costly penalties, got on the board first with a 1-yd TD run at the 9:51 mark of the opening quarter to take a 7-0 lead. That would be the only scoring done in the 1st quarter and we would head to the 2nd quarter with the Generals ahead, 7-0. Both teams were trading possessions back and forth in the 2nd quarter until Heritage intercepted a pass and took it all the way to the end zone to increase the lead to 14-0 with 5:22 left in the 1st half. The Generals again added to their lead at the 3:37 mark with a 9-yd TD run to make it 21-0. After nearly missing on several prior chances, Senior QB Jacob Brumby connected down the middle of the field to an open Zach Goss for a 56-yd TD pass at the 1:09 mark of the first half. However, Heritage would strike just before the half with a 35-yd TD pass to give us a halftime score of 28-7 in favor of the Generals. The Dragons, came out battling in the 3rd quarter as they’re opening drive of the 2nd half lasted over 6 minutes, & was capped off by a 1-yd TD run from Sophomore C.J. Streicher to make it 28-14 with 5:46 left in the 3rd. Then, the Pickens defense would step up as Brady Moore picked off a pass attempt that was short of it’s intended target, & set up the Dragons with good field position after a nice return. The esuing drive stalled however & we would head to the 4th with Heritage leading, 28-14. A pair of 1-yd TD runs from the Generals at the 11:47 & 7:13 marks of the 4th, gave Heritage a 42-14 lead over the Dragons. Pickens would not go quietly however as Brumby found fellow Senior Josh Cain on a well designed screen play & Cain would take it into the end zone from 28-yds out to make it 42-21 with 4:05 left in the game. The Generals, would score late in the game with a 13-yd TD run to give us a final of 49-21. 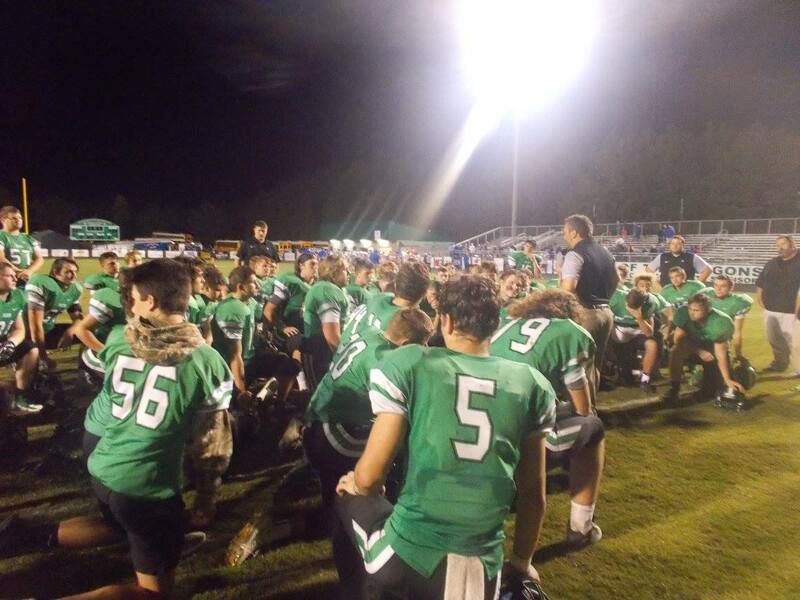 With the loss, Pickens finishes the regular season at 5-5, & in a tie for 3rd in the region at 3-3. Due to the 3-way tie, Pickens, Northwest, & Southeast Whitfield will play in a mini-playoff on Monday at 7 p.m. at North Murray. Pickens and Northwest Whitfield will play first. The winner, will be in the playoffs. The loser of that first game, will then play Southeast Whitfield. Winner of that game will be in the playoffs. The loser, will finish 5th in the region. Next Article » Republican, A Metaphor for Incompetence? 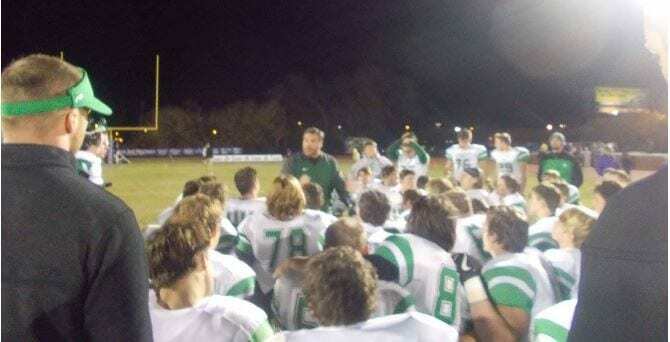 Last night, the PHS Dragons varsity football team hosted the LaFayette Ramblers for Senior Night. 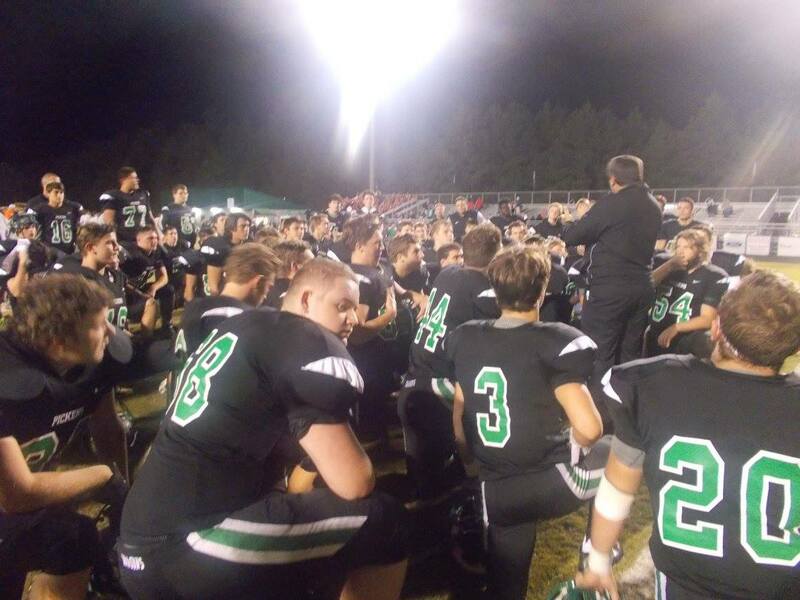 Pickens, needed a win to stay in the thick of the playoff race coming down the stretch of the season. Prior to the game, the seniors from the football team, cheerleaders, & band were recognized for the contributions during their time at PHS. 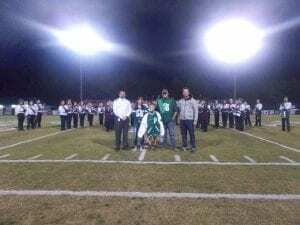 Another special presentation that happened prior to kick off, was PHS presenting the family of the late Shawn Mask with his Letterman’s jacket. LaFayette won the toss and elected to receive the opening kick to get the game started. The Pickens defense was able to get the Rambler offense off the field & it would be the Dragons turn to find the first points. Those first points of the game were scored by Junior RB Robert Davis after a 5-yd run to make it 7-0 Pickens with 7:11 left in the opening quarter. The Dragons found the end zone again in the 1st quarter, this time, through the air as Senior QB Jacob Brumby connected with Sophomore C.J. Streicher from 49-yds out for the TD. After one quarter of play, the Dragons held a 13-0 lead over LaFayette. Pickens got on the board for the first time in the 2nd quarter at the 10:22 mark after a 7-yd TD pass from Brumby to Junior Zach Goss to make it 20-0. After Senior Zach Swaim recovered a fumble & took it to the 7-yd line, fellow Senior Jacob Brumby finished it off on the next play with a 7-yd TD run to make it 27-0 Dragons with 8:08 left in the half. After nearly scoring on the previous play, Senior WR Josh Cain finished off another scoring drive for Pickens with a 1-yd TD run to make it 34-0 Dragons with 5:14 left in the half. The Dragons were getting it done defensively on the night as well. Junior Trevon Hawkins, took the ball away from the LaFayette runner & ran it back for the score to make it 41-0 Pickens with 4:53 left in the half. On the ensuing LaFayette drive, the Ramblers were looking for points prior to halftime. However, Kaleb Ray timed his jump, & made a great catch in the end zone to give the ball back to the Dragons. Pickens would turn that interception into points as Brumby connected with Streicher once again. This time, from 6-yds out to make it 48-0 Dragons at the half. The Dragons picked up where they left off in the 1st half as they started the 3rd quarter with the football, & ended their first drive of the 2nd half with points as Streicher (now in at QB), strolled in from 7-yds out for his 3rd TD of the game & we would head to the 4th, with Pickens ahead of LaFayette, 55-0. The Ramblers got their first points of the game at the 10:27 mark of the 4th after a 4-yd TD run to make it 55-7 Dragons. The ensuing kickoff was a short pooch kick, & it was fielded by Hawkins, who then took it the distance for the touchdown making it 62-7 Pickens. Your final from Jasper would be 62-7. With the win, the Dragons move closer to securing a playoff spot. With Southeast Whitfield’s win over Northwest Whitfield last night, that puts Pickens in 3rd for the moment. Next week, the Dragons will travel to Heritage to take on the Generals in what is more than likely, the biggest game of the whole region schedule. 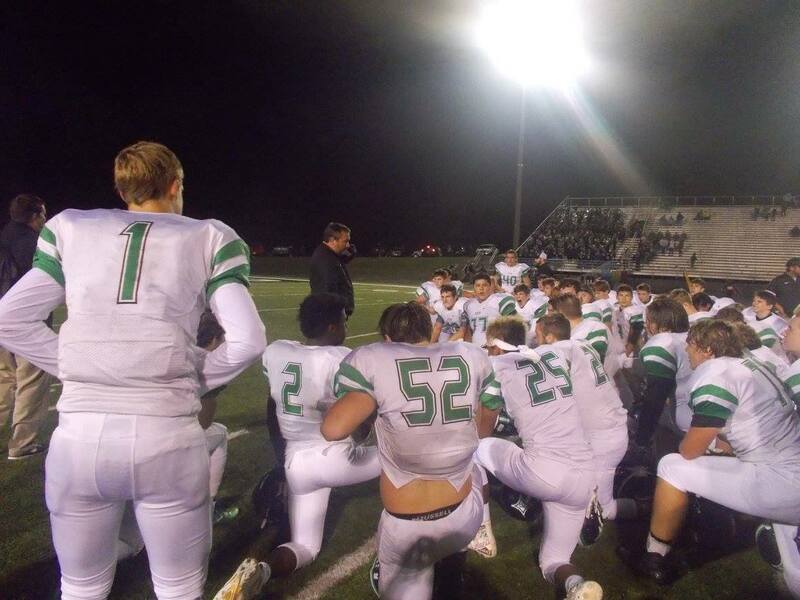 With a win next week over Heritage, the Dragons will vault into the #2 seed of region 6, & host a playoff game. A loss, makes things a lot more crowded & a lot more complicated. « Previous Article Join the Advanced Disposal Team - We Are Hiring!! 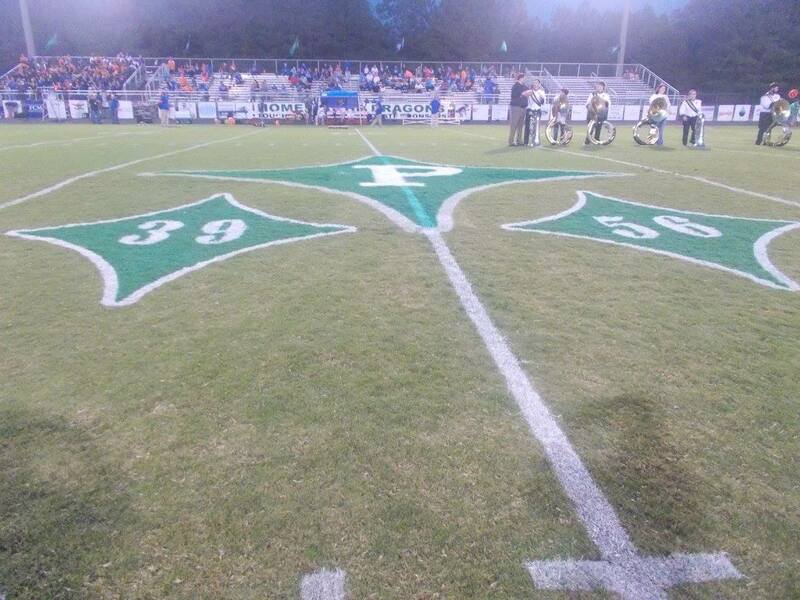 Last night, the PHS Dragons varsity football team hosted the Northwest Whitfield Bruins in a crucial 6-AAAA region game. With a win, Pickens, would hold 2nd place by itself. Before the game, there was a moment of silence to honor the late players the team has lost this year, Jordan Simonds, & Shawn Mask. Their numbers were painted at mid field last night. Northwest Whitfield won the toss, but elected to differ to the 2nd half, giving the Dragons the ball first. Pickens would be unable to get anything going on the opening drive, giving the ball to the Bruins. On the strength of their run game, Northwest Whitfield drove down the field, & got a passing TD to make it 7-0 Bruins with 10:13 left in the 1st quarter. The Dragons evened things up after Senior Jacob Brumby pitched it to Junior Robert Davis on the option & Davis got in from 14-yds out, tying things up at 7, & we went into the 2nd quarter all knotted up at 7. The Bruins took the lead back at the 10:06 mark of the 2nd quarter after a field goal, to make it 10-7. Northwest Whitfield stretched their lead out to ten after an 18-yd TD pass at the 4:10 mark. Just before the end of the 1st half, the Bruins again found the end zone after an 8-yd TD pass, to bring the lead to 24-7 over the Dragons going into the break. In the 3rd quarter, Pickens stuffed the first drive of the 2nd half for Northwest Whitfield & looked to get back into the game. At the 9:09 mark in the 3rd, Davis collected his 2nd rushing TD of the game, this one from 10-yds out, making it 24-14 Bruins. The Bruins on their next drive were held to a field goal attempt. The Dragons got pressure up front and blocked the kick, & took over at their 19-yd line. One play later, Davis made a house call from 81-yds out for his 3rd TD of the game, & Pickens cut the Bruins lead to 24-21 with 7:43 left in the 3rd. Northwest Whitfield got into the end zone just before the end of the 3rd after a 41-yd TD run to make it 31-21, going to the 4th. Both teams went back & forth in the 4th quarter, however the Bruins added to their lead with a 9-yd TD run late in the quarter to seal the win. Final score, Northwest Whitfield 38, Pickens 21. Pickens will be back on the road next Friday as they travel to Rossville to take on the undefeated, 4-A top ten, & 6-AAAA region leading Ridgeland Panthers. 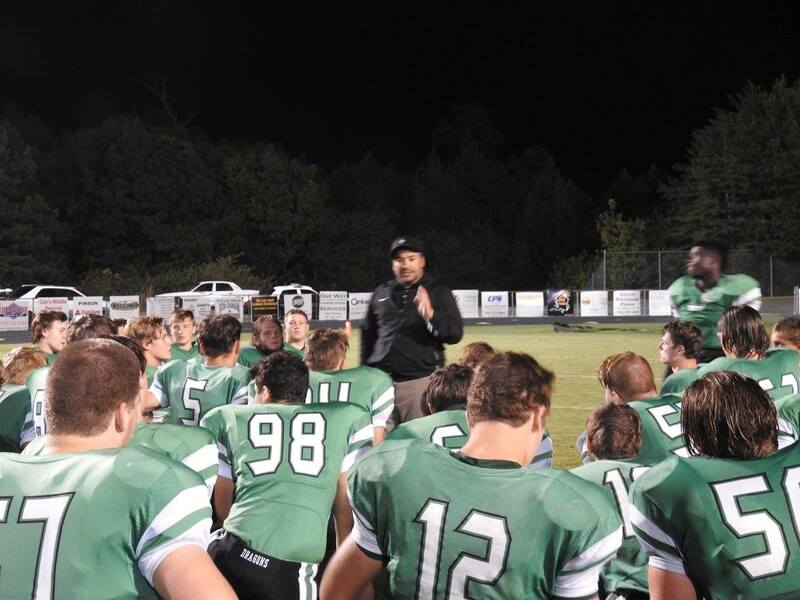 Pickens shocked Ridgeland in a similar situation at home last year, & have had recent success against the Panthers. « Previous Article Will Charlie Dent Retire clearing the way for Republican Establishment Candidate Ryan Mackenzie? This past Friday, on a cool, brisk evening, the PHS varsity football team travled down to Cartersville to take on the top seed from region 5, the Cartersville Purple Hurricanes in the first round of the GHSA 4-A State football playoffs. This would be the 21st meeting all time between the two schools. Pickens, won the toss and elected to receive to start the ball game. After several first downs on a good opening drive, the Dragons were forced to punt. The Canes got on the board first at the 6:45 mark after a 17-yd TD pass making it 7-0 Cartersville in the opening quarter. Cartersville added to the lead at the 3:23 mark of the 1st quarter with a 41-yd TD pass making it 14-0. The Canes would score just before the end of the 1st quarter with a 4-yd TD pass giving us a score of 21-0 Cartersville after one. In the 2nd quarter, Cartersville would again add to their lead after a 1-yd TD run to make it 28-o with 9:16 left in the first half. Pickens nearly snagged a fumble in the end zone after a long completion from the Canes, but were unable to secure it as Cartersville was able to fall on it and make it 35-0 at the 4:43 mark of the 2nd quarter. The Canes would score again just prior to halftime with a 51-yd TD pass to give us a score of 42-o. In the 2nd half, things started picking up for the Dragons. After a high snap, the Dragons pounced on the loose ball, then a fumble occured, then a quick thinking Hunter Hermann scooped up that fumble, and took it into the end zone for the score to make it 42-7 Canes with 10:18 left in the 3rd. Cartersville scored on a 19-yd TD pass to make it 48-7 Canes as we headed to the 4th. In the 4th, Pickens would find the end zone twice. This time, with the offense. The first score in the 4th came from Robert Davis. Davis was able to sneak through the left side of the defense for a 6-yd TD run at the 8:21 mark to make it 48-14. The 2nd score, was set up by a beautiful punt return that Davis nearly took all the way. Jacob Brumby finished it off with a 3-yd TD run to make the score 48-21. Your final in this one, 48-21 Cartersville. Last night, the PHS Dragons varsity football team hosted the North Hall Trojans out of 3-A in the first home game for the Dragons in the 2017 season. These two schools played each other last year in Gainesville, where the Trojans pulled out a close 16-8 win over Pickens. Much like their game with Pepperell the week prior, the Dragons were looking to exact a little revenge on the Trojans. North Hall won the toss and elected to get the ball first, & got points on their first possession of the ball game. The Trojans used an 18-yd TD run to take an early 7-0 lead with 7:34 left in the opening quarter. North Hall then picked off a pass on the Dragons first play from scrimmage, then added to their lead with a 1-yd TD run at the 6:03 mark to make it 14-0 Trojans in the 1st quarter. Pickens got back into it with a 62-yd TD run from Junior Robert Davis at the 5:01 mark to make it 14-7 North Hall in the 1st. The Trojans answered the Dragons score with a 24-yd TD pass to stretch the lead out to 21-7 with 3:17 still remaining in the 1st. Pickens then would respond with a 28-yd TD pass from Senior Jacob Brumby to Junior Zach Goss Jr at the :29 mark of the first. Sending us to the 2nd quarter with the score, North Hall 21 Pickens 14. Compared to the 1st quarter, scoring wise, the 2nd quarter was really tame. The Trojans added to their lead with a 1-yd TD run at the 8:42 mark, making it 28-14. As the 1st half came to a close, it turned into the Goss Jr show. Brumby connected with the Junior wide out several times on the final drive of the half including a 7-yd TD strike with :22 seconds left to make it 28-21 North Hall as we went into the half. The 3rd quarter of this one, belonged to the Dragons. Pickens began the 3rd, and the opening possession of the 2nd half was capped off by a 38-yd TD pass at the 7:03 mark from Brumby to Goss Jr. Their 3rd TD connection of the night. That tied the ball game up at 28 a piece. As the 3rd quarter came to an end, Sophomore C.J. Streicher plowed his way in from 7-yds out to give the Dragons their first lead of the night, 35-28, going to the 4th. Just 1:35 into the 4th and final quarter, the Trojans tied things back up at 35 after a 38-yd TD run at the 10:25 mark. Pickens, would not be fazed however as the duo of Brumby & Goss Jr, hooked up for a fourth time on the evening with a 17-yd TD pass to regain the lead 42-35 at the 6:24 mark of the 4th quarter. With time quickly moving down on the clock, North Hall looked to send this game into overtime, or win it outright with a score & two-point conversion. On 4th down, the Trojans were near the goal line looking to score with just :12 left. The pass attempt into the end zone sailed over the intended targets head. The Dragons held on for the win, 42-35. Pickens will continue their stretch of home games next week as the North Forsyth Raiders of the 7-A classification comes to town. This will be the final non-region game before region play begins for the Dragons on the 29th. 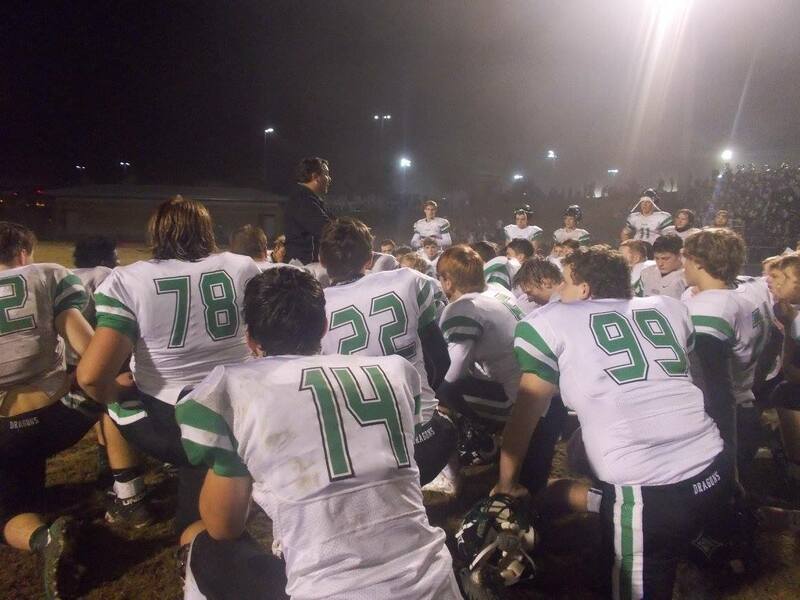 This past Friday, the PHS Dragons varsity football team made the long trip up to Rossville to take on the num. 5 ranked team in 4-A, the Ridgeland Panthers. In recent meetings between these two teams, they have provided some heart stopping excitement for the fan bases & looked to have another good game this past Friday night. The Panthers, won the toss, but elected to differ to the 2nd half, giving the Dragons the ball first. Ridgeland was able to pick off a 3rd down pass attempt after it had been tipped, and took it to the end zone for the early score and a 7-0 lead at the 10:34 mark of the opening quarter. The Panthers stretched it’s lead out to 14-0 after a 3-yd TD run at the 6:24 mark. Ridgeland added a 2nd 3-yd TD run to take a 21-0 lead over Pickens going to the 2nd quarter. Both teams traded series’ until the Panthers tacked on a 36-yd TD run at the 4:02 mark to make it 27-0. The Dragons got on the board for the 1st time on the night after Jacob Brumby hooked up with Zach Goss for a 25-yd TD. Goss, made and outstanding catch, and then stretched out to make it into the end zone to make it 27-7 Ridgeland at the 2:55 mark of the 1st half. The Panthers got a 61-yd TD run at the 2:40 mark, to give usa score of 34-7 at the half. The 2nd half was a very back and forth half with the two teams finding the end zone multiple times in the 3rd quarter. The Dragons kicked off the scoring in the 3rd at the 5:44 mark after a 25-yd TD run by Robert Davis to make it 34-14 Panthers. Ridgeland scored on a 76-yd TD run at the 4:40 mark to make it 41-14. Brumby & Goss connected for a 2nd time at the 2:14 mark on a 31-yd pitch and catch to make it 41-21, going into the 4th. The Panthers scored just as the 4th got underway after a 30-yd TD run to make it 48-21 with 11:51 left to go in the game. Ridgeland then would add the final points of the game after an 18-yd TD run to make it the eventual final score of 55-21. 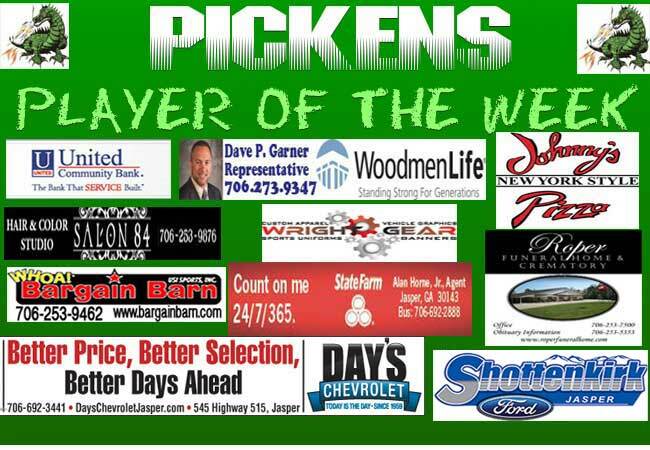 Pickens, is now 4-4 overall, & 2-2 in region play. They are currently tied in 4th with Southeast Whitfield, but hold the tiebreaker over the Raiders due to the win earlier in the season. The Dragons can lock up a playoff spot next Friday against LaFayette with a win.